We spent a bit less than two days in Ho Chi Minh, arriving on Sunday evening and leaving late on Tuesday morning: two teenagers and two adults who hadn’t travelled together before. 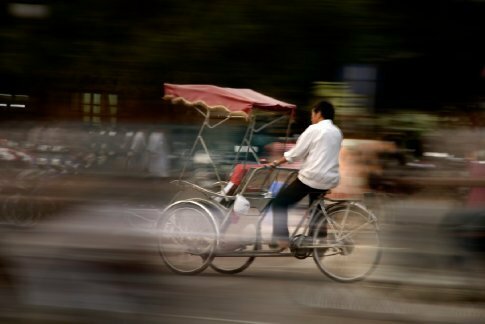 Taking a spin in a cyclo (one of Vietnam’s three-wheeled bicycle taxis) was high on my wishlist. But given the short timeframe and challenging dynamic, I knew we’d have to be opportunistic; grabbing the chances that came our way and abandoning the ones that didn’t, without regret. So I kept the wishlist loose. 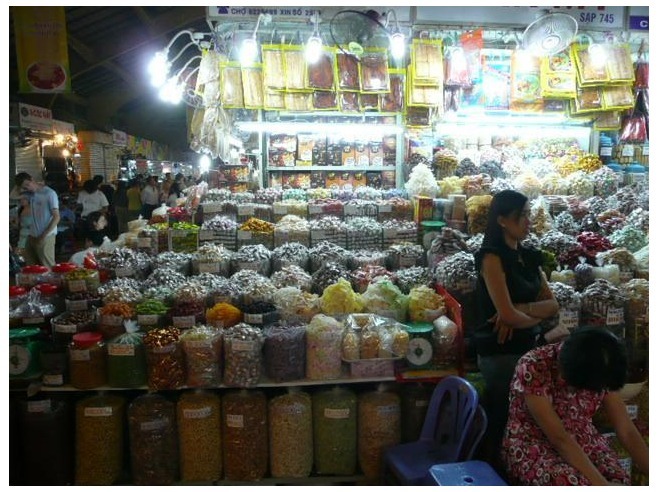 On the Monday morning, we visited Ho Chi Minh’s largest markets – Ben Thanh – whose narrow aisles were a dense coagulate of people, noise and humidity. Pretty much as expected. What I wasn’t prepared for was the trapped and slightly panicked feeling this combination would conjure in me. Or the vague disappointment of the markets being, well, a lot like Paddy’s Markets in Sydney, really. I was told off twice by stallholders: once for standing too long in front of a stall and once when my bare forearm brushed close to a rack of silk garments. I felt somehow singled out and wronged, which made me a bit teary. So it was wonderful to emerge into the open air, and head for the shade of a nearby park. At the corner, we were approached by a cyclo rider, but turned him down, intent on a rest and a drink. As we walked away, he warned us in paternal tones to be careful of junkies in the park. Politely noting his warning, we headed out of the 38 degree sun and into the park’s seductive shade. It turned out to be a very ordinary park – full of families and schoolkids and elderly people, with no signs of drug-use either current or nocturnal. Odd. We wondered what the cyclo guy was on about, but only for a moment – there were too many other interesting things snagging at our attention. The next morning – our second and last in Ho Chi Minh – we had until 11am to explore some more before heading off to the airport to catch our flight to Danang. We went into the city with the specific purpose of finding a pair of sneakers for my daughter, and having achieved this, we were approached by another cyclo rider. My boyfriend was reluctant, but seeing how keen I was to experience the city in a different way, he agreed. The cyclo guy quoted 12,000 VND (about 60 US cents) for the 15 minute ride. According to my pre-trip research, US$2 was the standard price for an hour, so this sounded about right. He rounded up two friends – one cyclo each for the adults, one for the kids to share – and I figured we were up for 36,000 VND at the end of the trip. From the moment we set out, I was so glad we’d decided to do it. I loved the breeze across my skin as the cyclo cut through the stifling heat. I loved the thrill of moving under pedal-power among all the darting motorbikes and cars. And the cyclo guy was a fantastic conversationalist. He chatted constantly in English – telling me about his family, asking questions about Australia and peppering the conversation with facts about the buildings we passed, war history and Vietnamese culture. He described the incessant beeping of horns on Ho Chi Minh’s streets as the ‘music of the city’. It was a conversation, he said: ‘Hello!’, ‘Coming through on your left’, and so on. And I agreed that it sounded very different to the hostility you’d hear in the honking on Sydney’s streets. He also cautioned us to be careful of our cameras and bags, encouraging us to stow them away whenever we got them out, so they wouldn’t be snatched by ‘motorcycle thieves’. By the end of our short ride, I felt very much at ease. We pulled up a block from the hotel, since the cyclo riders said they were not allowed to use the stretch of street near the hotel, and they helped us take photos of each other on the cyclos. I jumped off, grinning like crazy. That was great! Then came the sting. The cyclo guy held out his hand, firmly, smilingly requesting 1,200,000 VND. I was flustered, thinking I must have been unclear on our agreed price. Not wanting to ruin the lovely moment for everyone by getting into an argument, I opened my wallet and began fumbling through my notes, hoping I had enough. A bit annoyed with myself, I paid him; nearly US$60. A huge amount even in Australian terms, but more so in the Vietnamese context; that night we’d be paying just US$40 for two air-conditioned hotel rooms including breakfast and WiFi. ‘This is the price for one,’ he insisted, demanding the same amount again for each of his colleagues. Finally, I summoned some indignation and outrage from the shame, and refused. The three cyclo men crowded in on us, raising their voices and insisting that we’d agreed on a price, that it was already a discounted rate and that we were ripping them off. My boyfriend raised his voice in return, gave them another 500,000 VND and told them to go away. Afterwards, I felt stupid and apologetic – conscious that I was the one who landed us in that situation. But reflecting on it now, I realise how sophisticated and well-honed the cyclo guy’s techniques were. By acting as our protector from potential thieves and disclosing personal information, he built up a sense of trust that put me off guard, and he leveraged that to make me feel that I was the one in the wrong. It was probably the same seed the cyclo rider of the day before was trying to sow when he warned us about the imaginary junkies in the park: I’m looking out for you, trust your safety to me. And yet, we enjoyed the ride right up until those very last moments, and I would certainly do it again. But next time I’d insist that he write down the price before we climb in, and drop us right at the door of the hotel, where he’d have less chance of winning a dispute. 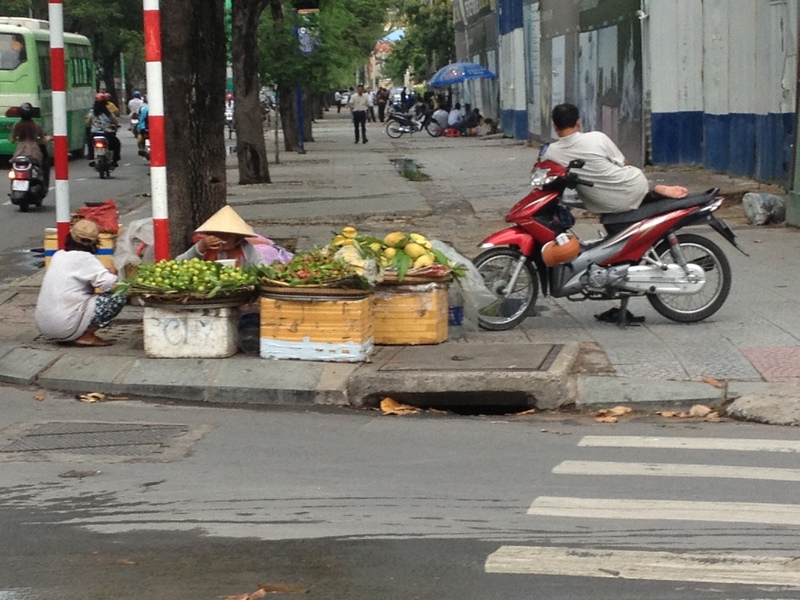 This entry was posted in Travel stories, Vietnam (May 2013) and tagged cyclo, Ho Chi Minh, markets, Saigon, scam, travel, Vietnam, WPLongform. Bookmark the permalink.